Having worked with more than 250 subjects in healing in last one year on physical level the most common argument you hear is “I have a physical ailment because of an external factor (change in weather/ met with an accident / ate something / I have an allergy etc etc… the reasons are limitless. We have to understand that the physical ailment is a symptom of the hidden emotional issues that reside within for years. Any person under perfect circumstances in life will never use an abusive substance for his body. Further cancer and tumors is a phenomenon where body makes more cells than required and they attach to the weakest organ of the body. Why will more cells be generated than required is when the control system the brain is messed up by unwanted secretions/impulses. The trigger/impulse is created by the mind and it feeds on emotions. So do you think smoking or drinking is a cause for your poor health? Hmm yes but more than that the toxic emotions are. 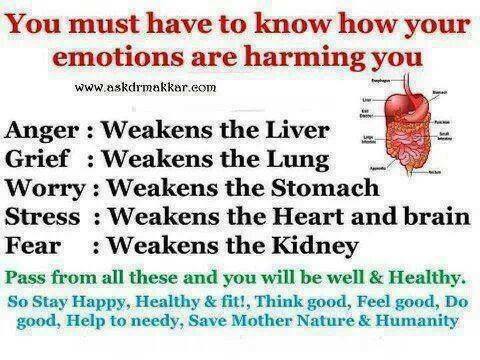 The specific emotions and their effects on the body. 98% of the population is leading an acrimonious life full of negativity. We concentrate on what is not important in life. The purpose of life is to create abundance in all areas, to live in happiness to experience being. Pranic Psychotherapy, EFT, Forgiveness, Tithing,Shadow Work, and meditation and other techniques that work on clearing emotional blockages are found effective 🙂 for most of the chronic ailments.